When I arrived on the internet, it was a place full of people from the privileged class. Coming from an under privileged background, I had the feeling that may be people will not like me on the internet. Fortunately, it was the time when anonymity on internet was not considered a threat or a bad thing. Internet itself was a new phenomenon and people were reluctant to share personal information with strangers. Then I started meeting people using a pseudo name, learned a lot from them. I grew up, and so did the Internet. Slowly and gradually, I realized that the real me is much better than the ‘persona’ I have created for myself. The real me has better stories to tell, better experiences to share, and I am perfectly capable of being just me without being awkward. I believe that lots of people who want to use internet with pseudo names don’t want to hurt anyone. They are real people with real experiences of their own. They want to be the part of this wonderful conversation we call the web, but they have some concerns of their own. For some people these concerns could be their insecurities, their fears, or maybe they just don’t want to be known and identified with the same identity that they have in real life. They choose anonymity to feel safe and comfortable. Recently, social networks have started enforcing a real name policy. On its launch, Google+ strictly forbade pseudo names and discouraged people by blocking profiles made using pseudo names. How a web profile could be real? Anyone can steal a photograph, change it using photoshop, and use it as a profile picture. There are even software available that help you generate real names. Anyone can generate a 100% doubt free real profile within minutes and use it for years before anyone could find out. I believe that by restricting people from creating pseudo names or anonymous profiles we are interrupting the discussion. These people behind fake profiles have so much to offer and the layer of anonymity provides them the comfort they need to share their stuff. You could still go to small web forums where almost everyone is online with a pseudo name. The flavor, the colorfulness, the texture this anonymity adds is actually very beautiful. I fear that by discouraging anonymity, we will make our online social networks just like the off line world. People will say what they think others would like hearing. Not everyone has the confidence to be just themselves without fearing judgment from their peers. Anonymity on Internet Threatens Trust and Credibility? People with anonymous identities completely understand that other people will be reluctant to trust them. They still want to remain anonymous so I think it is our choice whether we still want to trust them or not. I will trust an anonymous profile if it provided me help in some forum, or asked a question on Quora. I will certainly not hand them my bank account details, buy things from them, or invite them over my house for dinner. The responsibility to protect ourselves from harm on the internet lies in our own hands. If we are using real names and pictures on the social web then we must be equipped with tools to protect our privacy. If someone feels that they cannot maintain their own safety and privacy online then perhaps this is one more reason to remain anonymous. Credibility should be judged by the action of the people not by their pseudo names or avatars in profile pictures. I wouldn’t mind voting up a good answer on Quora posted by a guy named “MrButterfly”. If the answer is good, helpful, detailed, informative and correct, then this is what I signed up for and I should appreciate it when it is offered to me. However, I may not be able to appreciate MrButterFly if he provided me medical advice, investment advice, offered me to purchase something or hire their services. Just like MrButterFly, I also have the choice to decide what is best and useful for me. A multi-faced life on the Internet? Another argument is that it is just not healthy to use a pseudo name among the company of people who are online with their actual names and pictures. I think that people using their actual names and pictures made this choice on their own. If they want their choice to be real, accepted, and appreciated; then they should also accept other people’s choice to remain anonymous and still be accepted and appreciated. No matter how many profiles this one person creates. They are still an individual, with a conscience; they should be treated as any intelligent being should be treated. If they decide to change into multiple profiles it is their choice. Again we have a choice too, we have a choice to make our own decisions. If we suspect a profile for misbehaving or being inappropriate then we can use our right to ignore them. We all are living with multiple faces and personas in our real lives. There is a Noumaan that people know at work, and then there is a Noumaan that people know at home. Noumaan, the same person is seen differently by different groups of people. Whether it is Noumaan’s deliberate choice to be seen differently by different groups, or not; we are no one to judge him for that. If this rule applies in real life, then why it can’t be applied on the Web? Don’t we all want web to be just as real as our offline lives? I am not suggesting that we should all start living multiple lives on the web. I am saying that most of us already live multiple lives in the eyes of people around us. How they see us depends on how we interact with them and this interaction develops an image of us in the eyes of others. Sometimes we even try to give an impression of ourselves that is not real us. Sometimes we want to scare some people off, so we put a rude angry face on. Sometimes we want our bosses to like us so we put a happy go lucky, hardworking office guy face on, there are lines that we use at home to make our wives happier, there are lies we tell to entertain our children. In the end, I wonder exactly what is real. How real we are? And what right to do we have to question the reality of each other? 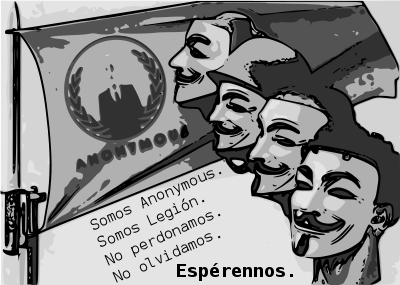 Anonymous – By Choice. With Reason?